Cherryh, C.J. (1989). Rusalka. Ballantine Books; New York. As a young adult, I devoured the tales of the brilliant and consummately skilled science fiction writer C.J. Cherryh. The first of her books that I enjoyed was Rider at the Gate, and the memory of it still leaves me with chills of mystery, magic, and adventure. C.J. had her own adventurous life as a teacher, touring students through ancient ruins in England, France, Spain, and Italy, while she concurrently managed to publish over 60 novels and short-story compilations (Wikipedia article). Many of these tales have received Hugo and Locus Awards; her work has redefined and pushed the boundaries of science fiction (above and beyond the fact that she was one of the earliest female science fiction writers) (Wikipedia article). Cover design by Darrin Ehadt, 1989. I have more recently had the patience to go back and read through her much longer works – including the Russian Trilogy of which this book is a part. These stories are set in medieval Russia and draw heavily on Slavic mythology – this particular tale tells a story about a girl who haunts a river and drains the life out of nearby people and forests (Wikipedia article). Unlike C.J.’s other works, wizards take a central role in this series. These wizards perform magic by ‘wishing’ for certain outcomes; the danger of this wishing lies in the most casual desire having an unintended outcome (Wikipedia article). I found the book thoroughly engrossing for its mixture of history, fantasy, and horror. 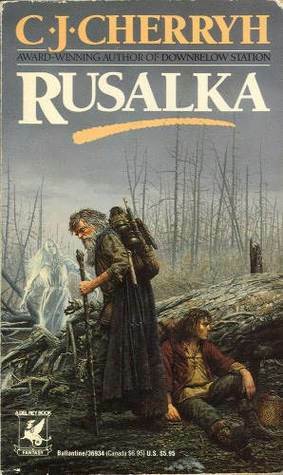 The ghosts which appear throughout Rusalka were enough to make me jump under the covers and keep them tucked tight under my chin while reading. Rusalka is the first in the Russian Trilogy, followed shortly after by Chernevog (1990) and Yvgenie (1991) (Wikipedia article). It is thus worth starting your exploration of C.J.’s excellent work with this particular novel.